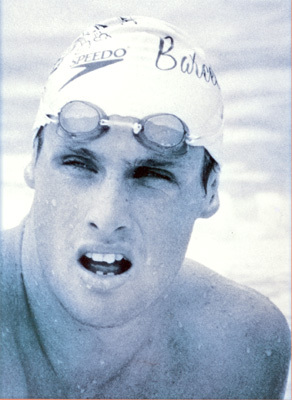 Andrew Baildon was the first Australian to break the 50 seconds barrier for the 100 metre freestyle. The was one of the more memorable achievements in his illustrious career spanning ten years in one of the world's most competitive sports - swimming. You could say Andrew sprinted like his life depended on it. And in the early stages it did. Memories of his near drowning spurred him on to learn how to swim to save himself. After being rescued by his sister Kate in the family pool, Andrew's parents ensured he went to swimming lessons every single day - until he could swim. Andrew broke his first Australian Schoolboys record at the age of 10 and at 14 with an Australian age group record under his belt won on his way to the junior Olympics in Japan. A 5 gold medal haul in Tokyo against older opponents confirmed the start of his climb to swimming stardom. As a 16 year old school boy, Andrew was the youngest male selected to represent his country at an Olympics (Seoul 1988) since dual Olympic Gold medallist and Australian swimming great Michael Wenden. As well as equalling Wenden's record of four gold medals at single Commonwealth Games, Baildon became his son-in-law when he married Karen Wenden, a former Miss Universe Australia, in 1998. Baildon achieved numerous State and National championships throughout his career and was the Australian record holder for the 50 and 100 metre freestyle from 1989 - 1996 and the Commonwealth record holder for most of that period. Under the masterful guidance of Miami swim coach Dennis Cotterel, Baildon became the first swimmer in the Commonwealth to break the 50 seconds barrier for the 100 m freestyle when he smashed his own Commonwealth record to win gold (49.80s) at the 1990 Commonwealth Games in Auckland. Baildon sealed a memorable meet by anchoring the gold medal winning Australian 4x100m freestyle relay team. Baildon capped the year showing versatility by winning the number 1 World Ranking for the 50m Butterfly (Short Course). The dual Olympian was named Australian Team captain in 1993 and in 1994 when Australia achieved one of its' best pool performances at the Commonwealth Games in Victoria - Canada. An early change in focus from breastroke to freestyle sprinting because the former was too slow and boring saw Andrew Baildon become on of Australia's great sprint champions.